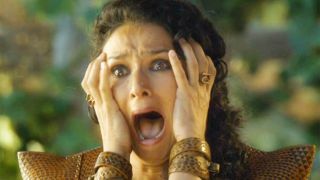 Game of Thrones has a reputation for giving us some of the most shocking television moments of all time, and we’re sure that’ll continue to be the case when Game of Thrones season 8 premieres this Sunday, April 14. Whether it’s our favourite characters dying way too soon or the big bad no one saw coming, there’s certain Game of Thrones moments that’ll stay with fans forever… and the cast is no different. When I sat down to talk to the Game of Thrones cast about the final season, I also quizzed them about their most shocking Game of Thrones moments. As you can imagine, a lot of them are the same as ours - Ned’s death, the Red Wedding - but there’s a few other unexpected moments that get a mention too, and Maisie Williams’s most shocking moment is surprisingly unique. Read on to find out what the Game of Thrones cast think are the most shocking moments from the show (so far) and prepare yourself for some seriously mind-blowing events to come in the final season. I mean, it wouldn’t be Thrones without at least two or three OMG scenes an episode, right? And in case it wasn't blindingly obvious, there's Game of Thrones spoilers below for the show so far. "I’m still mad about Ned Stark," says Jacob Anderson, who plays Grey Worm on the show. "Because I think it came out of left field. I think the really great thing about that particular death is, it kind of set the tone for the rest of the show. You just know: ‘Alright, I can’t trust these people. I can’t trust anyone.’"
Nikolaj Coster-Waldau, AKA Jaime Lannister, agrees: "I think that was the make-or-break of the show, because we were like, ‘Is this going to be the end?’ And it wasn’t." "It’s still the Ned Stark beheading," John Bradley, who plays Samwell Tarly, tells me. "It is! Just because you saw that, and it just… At that moment, all the rules just crumbled to dust. All the rules where you say, ‘This is your central character. Latch onto them, because they’re going to guide you through it. No matter how weird it gets, they’re going to guide you through it.’ And he was our Tony Soprano, our Jimmy McNulty, and all of these characters we’ve seen before. He was the one. And then suddenly he’s gone. You think, ‘That’s the man I assumed who was going to be safe. And now he’s gone. They’ve killed him, so no one is safe.’"
"I remember, I read the books before I watched season 1, [and] I remember turning back and forth for ages, trying to figure it out," adds Hannah Murray, who plays Gilly. "I was like, ‘How have I gotten this confused? What has actually happened? It can’t be that.’ Yeah, it’s an amazing piece of storytelling." "Bran’s fall was so shocking," says Iain Glen, who plays Jorah Mormont. "It’s one of those hook moments where you think, ‘My God, this is a different sort of [story]… I didn’t see that coming.’ A ‘you cannot take anything for granted’ moment." "I think the moment that really stayed with me was Shireen Baratheon’s death," reveals Joe Dempsie, who plays Gendry. "I think shows like Game of Thrones contribute to this, but I think we’re all guilty of maybe getting desensitised to violence on television. We kind of know it’s all make-believe, and I’ve been there – I’ve stood on the set while that kind of thing is put together. So I know the mechanics of it. But I watched that scene, and I couldn’t quite get it out of my head. There was something incredibly harrowing about that for me." "I remember looking at the Red Wedding, going, ‘No. No, no, no, no. That’s wrong.’ And being quite upset," says Rory McCann, AKA The Hound/Sandor Clegane. Sophie Turner, who plays Sansa Stark on the show, agrees: "The Red Wedding, for me. And I think for everyone." "There’s a wonderful video called ‘The Red Wedding Reaction’ which is six minutes and five seconds long," says Liam Cunningham, who plays Davos Seaworth. "It’s people watching the Red Wedding, but their friends, who’ve read the books and know what’s coming, they get out their phones quietly, and are filming their friends watching it. "When I showed the audience [at an event] the screaming and the shouting at the screen, and that visceral punch in the stomach – they’re the moments that are extraordinary, and they’re the bits that if we’re doing our job properly, we can make an audience feel like that: make them hate us, and love us, and laugh, and all that sort of stuff. It’s just bloody good storytelling. It’s fabulous storytelling." "I think the most shocking moment was when we saw the Night King for the first time, and he touches the baby, and the eyes go blue," says Maisie Williams, AKA Arya Stark. "I was like… [makes shocked face]. I hadn’t heard of this character. I didn’t know anything about it. It [the show] was starting to come off the book. And all of a sudden, it was this whole new line of story that is now basically the leading line of the story. "That moment, it was like: ‘Everything has changed. The stakes are really high now.’ That was a moment that was pretty wild. I was looking at my mum like: ‘What? What’s he doing? What is that?’"
"I think the typical answer would be the Red Wedding. Even though I knew what was going to happen – the way it was executed was extraordinary," says Gemma Whelan, who plays Yara Greyjoy on the show. "And the Battle of the Bastards. I felt suffocated when I was watching that. I was breathing and not breathing with Kit [Harington]. I was physically watching it. It was brilliantly done." "That was so beautifully set up," says Jerome Flynn, AKA Bronn, when talking about Oberyn Martell’s fight against The Mountain/Gregor Clegane. "I was just falling in love with his character. And as an actor, he was doing such an incredible job. And the way it was done… it was also what Tyrion wanted Bronn to do, so I was kind of super-interested. And you thought, ‘Ah, he’s been a hero.’ It happened so suddenly. That got me." For more from the Game of Thrones cast, read all about what happened on their last day of filming. Spoiler warning: there were tears!